Last time, my review of a different Flying Dog offering (Dogtoberfest) left me wanting a lot more flavor. 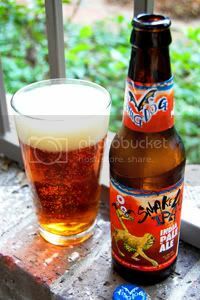 I decided that if any of their beers are going to be able to deliver on that, it would be their IPA: Snake Dog. To steal my own description about India Pale Ales (or IPAs): "The India Pale Ale style originated during the 1700s when British brewers learned that adding large amounts of hops helped protect beer on its long journey to far away colonies." The brewer describes this as a "Colorado-style" India Pale Ale, with specialty hops from the Pacific Northwest. The label features a very surreal Steadman illustration of a snake headed dog that appears to be tripping on acid, so the beer gets some originality points before I've even loosened the cap. Appearance: Brilliantly clear and golden-amber with a finger and a half wide high creamy off white head that settles into average lacing. Aroma: As one would expect, glorious floral hops absolutely dominate. One can also detect citrus and biscuity malt underneath. Taste: True to style, this beer is absolutely bitter thanks to a heaping serving of hops. Much more intense than other Flying Dog offerings I've tried, I'm glad to see they can crank it up a bit. Once you peel off all of the bitterness, you find lackluster sweet biscuit malt underneath. The booze is hidden well, but provides a welcome kick from time to time. Mouthfeel: Silky and full-bodied with the right amount of carbonation. A delicious bitter hop aftertaste lasts well into your next sip. Drinkability: While this beer is certainly aggressive, and I might take my time, I could certainly throw back a few of these in one sitting. Verdict: While not earth-shakingly amazing, this is quite a tasty little IPA. While I would be happier with something a little more exciting to accompany the bitterness, those hops still have me salivating for more. As I mentioned, I'm just glad that Flying Dog can produce flavorful beer. It makes me a little more excited about the other styles waiting for review in the fridge. Here's a beer that pops up in force every year around this time. From groceries store endcap displays to pub chalkboards, Buffalo Bill's Pumpkin Ale has quite a high profile for a few weeks each year. In my experience, this is the standard Pumpkin Ale for most people. Maybe this is all just in my region of the country, but as this beer originates from Buffalo Bill's Brewery in Northern California, I'm pretty sure it's not. With festive, non-pretentious packaging, and a reputation, I had high hopes for this beer. Appearance: A somewhat hazy amber body with a finger and a half of eggshell-white head. The head is fizzy and quickly settles into a minimal ring around the glass and leaves hardly any lacing. Aroma: Pie spices and overly sweet pumpkin, with more emphasis on the former than the latter. Taste: The same spices, general sweetness and dark fruit are the dominant flavors here, but the pumpkin just isn't coming through as much as it should. In fact, the whole flavor profile is decidedly on the thin side. Mouthfeel: On the similar note, the mouthfeel is rather thin and watery without much of an aftertaste. Carbonation is high enough to resemble soda at times. Drinkability: This beer goes down the hatch easily enough, although leaves a lot to be desired. However, if I was in the mood for a Pumpkin Ale at a bar where this was all that was available on tap, I'd still probably order a few. Verdict: I find this beer bland, and that it really fails to deliver on its biggest promise: pumpkin. But, I can certainly see it's appeal to the masses and therefore why it's become so popular. 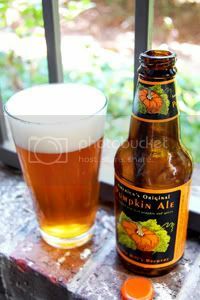 Pumpkin Ale is an appealing premise for the Fall months and this beer, being on the thinner and sweeter side, is not too much of a deviation from the regular macro fare. For the more traveled drinker, however, much more complicated and satisfying Pumpkin Ales can easily be found (my personal favorite being Dogfish Head's Punkin Ale).